Wilderness of Rajasthan - wildlife safari | wildlife travel | wildlife packages | wildlife tours | travel itinerary! This travel package has two wildlife National Parks - Sariska National Park & Ranthambhore Natioanl Park and one Bird Sanctuary - Keoladeo Ghana Bird Sanctuary with Indian culture desert tour along with Taj Mahal at Agra. Wildlife of Rajasthan is famous all over the country for its culture and wildlife. Millions of tourists from all over the world drop to this kingly state to witness the beauty of flora and fauna and renowned wildlife treasure of Rajasthan. The wildlife sanctuaries of Rajasthan have also become ideal bases for exploring the true beauty of nature for the visitors and there has been a steady increase in the wildlife tourism in this kingly state of India. Welcome to India, You will be received by Incredible Real India Tours representative at international airport and assisted to your hotel. In the Hotel you will have a brief description of your tour and the representative will hand over your documents regarding the tour, Overnight in Hotel. Delhi-Sariska: Morning leave for Sariska by surface (approx 03 hrs drive), on arrival transfer to hotel. Evening enjoy the safari at Sariska National Park famous for animals like the Tiger, Leopard, Caracal, Sloth Bear, Rhesus Macaque, Common Langur, Nilgai, Chinkara, Chausingha, Sambar, Cheetal, Mangoose, Hyena, Jackal, Fox, Desert Hare, Porcupine, Wild Boar, to name a few. One can also visit historical Kankawari Fort and ancient temple of Lord Shiva. Overnight at hotel. Morning leave by surface for Bharatpur Bird Sanctuary which is approx. 150 Km. from Sariska. On arrival transfer to your lodge. Afternoon visit the famous Bharatpur Park famous for its proximity to Keoladeo Ghana National Park, which has the largest concentration and variety of birdlife in whole of Asia. Morning leave by surface for Sawai-madhopur (approx 210 km). Sawai-madhopur is the entry point to Ranthambore National Park, which is surrounded by the Vindayas and the Aravali Hills. Amidst vast, arid and denuded tracts of the desert ecology of Rajasthan lies the oasis of biomass. 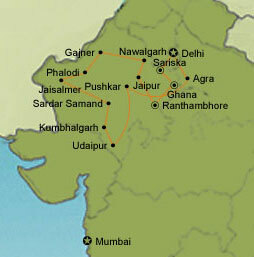 The Ranthambore National Park is spread over an area of 392 sq. kms of thick forest with nullahas and waterfalls. On arrival in Sawai-madhopur transfer to your lodge. Late afternoon jungle safari in a private Jeep (04 people) or in a Canter (to carry 20 people) to view the wildlife which includes the Tiger, Panther, Hyena, Jackal, Jungle Cat, Caracal, Sloth Bear, Cheetal, Nilgai, Wild Boar, Chinkara, Indian Hare, Mongoose, Leopard, Ratal, Fox & Sambar Deer, the pride of the park. Late evening return to lodge. After breakfast continue towards Jaipur and reach by lunch-time and check into hotel. After lunch set off to see the Pink city visiting the observatory Jantar Mantar built in 1727 by Sawai Maharaja Jai Singh II who was a mathematician , an astronomer an astrologer and a great musician of his era. He built five observatories throughout India – Jaipur, Ujjain, Varanasi, Mathura and Delhi but only the one at Jaipur is functional. Then visit the City Palace of the Maharaja of Jaipur with a fabulous collection of robes and saris in cotton and silk with gold latticed work. Jaipur- Nawalgarh: Drive down to the Shekhawati town of Nawalgarh (approx160 kms).Go for a horse safari in the Afternoon. Evening at the hotel in Nawalgarh. Nawalgarh - Gajner: Drive down to Gajner Palace and en-route visit Tal Chapper Wildlife Sanctuary near Salasar. The endangered species of Blackbuck and migratory birds like demoiselle cranes can be seen in this wildlife sanctuary. Overnight in Gajner Palace Hotel. In the morning enjoy the Gajner Bird Sanctuary, where you can see birds like Imperial Sandgrouse, Demoiselle Cranes (Kurja as the graceful birds are known in the local language).Gajner lake is a bird-watcher’s paradise. You can also see chinkara and Black bucks in the Sanctuary. Evening at leisure in your hotel. Gajner - Phalodi : In the morning leave by surface to the small town of Phalodi. Evening at leisure in your hotel. Phalodi - Thar Desert sand dunes -In the morning visit the area where the Demoiselle cranes come in thousands for their annual migration. After lunch drive down to Sam Sand dunes Via Jaisalmer (220 km). Overnight in camps on the dunes in the Thar Desert. Visiting the JAISALMER FORT - The oldest living Fort in the world and some astonishing havelis (Mansions). In the afternoon, proceed to the SAM or KHURI SAND DUNES for brief Camel safari & a typical Rajasthani Desert Village. View the sunset from the dunes, as the sky is set on fire. Return to the village for dinner amidst Rajasthani musicians playing haunting tunes. Stay overnight at the SWISS TENT CAMP/ HOTEL. To have a camel safari and stay at night in the desert or come back to Jaisalmer and sleep in the hotel it is up to your choice “Real India Tour” team will follow your choice. Sardar Samand is a large expanse of lake where flamingos, pelicans, ducks, geese, crane and kingfishers flock. Pali is only 55 km from Jodhpur but the location of the Sardar Samand Palace, against the lake, is removed enough for the ultimate hideaway. Kumbhalgarh - In the morning leave for Kumbhalgarh. In the afternoon visit Kumbhalgarh wildlife sanctuary. A large sanctuary in the Aravali Mountain ranges. It has a formidable collection of wildlife that includes leopards and sloth bear, a variety of deer including the chosinga or four horned antelope and the flying squirrel. The morning drive leads you to Agra via Emperor Akbar’s deserted city of Fatehpur Sikri, an almost perfectly preserved 4oo year old Mughal capital. Quintessential Mughal city, that was the capital of their empire in the 16th and 17th centuries. Apart from Taj Mahal, theirs is the magnificent Agra Fort to visit. Apart from Taj Mahal, theirs is the magnificent Agra Fort to visit. In the morning, take a leisurely breakfast, Later drive back to Delhi. You can visit Sikh Temple or you can walk around Cannaught Place, Take a dinner in the restaurants at this center of the city. A full day sight seeing of Delhi. Starting with Old Delhi with a visit to Red Fort, the Jama Masjid. In the afternoon visiting New Delhi, seeing the India gate, Parliament house, the Secretariat building and the Presidential house. Overnight in Hotel.